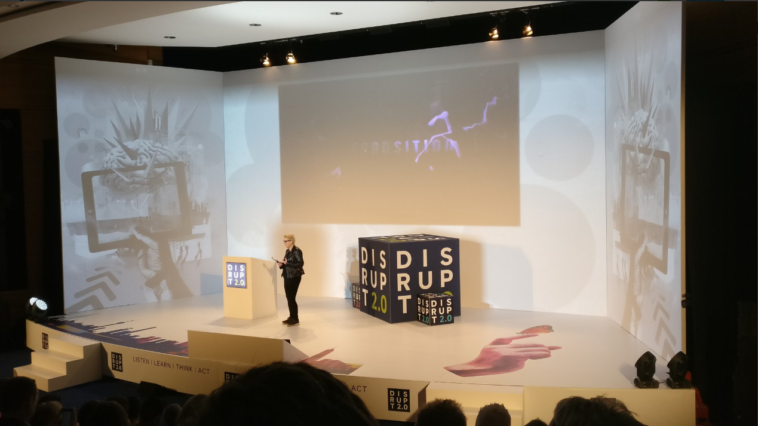 Janice Kirkpatrick, co-founder of Graven, was selected as one of eight key speakers at this year’s RBS Disrupt 2.0 which was attended by professionals, academics and leaders in the tech field. Janice shared the stage with a wide variety of speakers, including Tim Berners-Lee, the inventor of the World Wide Web. In her talk, Janice discusses how to be a creative by ‘unwrapping your inner designer’ to make sense of the world. At Disrupt 2.0 about unlocking your creativity and how that makes us most human; by using the process we call ‘design’ she explains how we can all collaborate in order to create an amazing future. Graven created and designed their own chocolate bar in collaboration with handcrafted Scottish chocolatiers, Cocoa Ooze, founded by entrepreneur Jamie Hutcheon. The bespoke packaging made for a visual and sensory experience to consider how we stop, slow down and think. As can be seen below, the specially designed chocolate bar made guests think about their own design process and decision making. Asking questions at every stage of the experience, the chocolate bar acted as the prime example of the importance of well thought through, design led decision making by stopping, slowing down and thinking. Janice highlighted the importance of analysing everything around you, questioning it and looking for its message and purpose. With Graven placing the emphasis on innovative design with digital processes at the heart of this, it was the perfect event to showcase the Graven way of working. RBS annual conference, Disrupt 2.0, now in its second year, showcases a range of world leading tech and design led pioneers to Edinburgh to discuss how technological innovation can be harnessed to address social needs across the country.